Wow, the beads in this fabulous 1950s art glass triple row collar make for a truly unique and stunning creation. 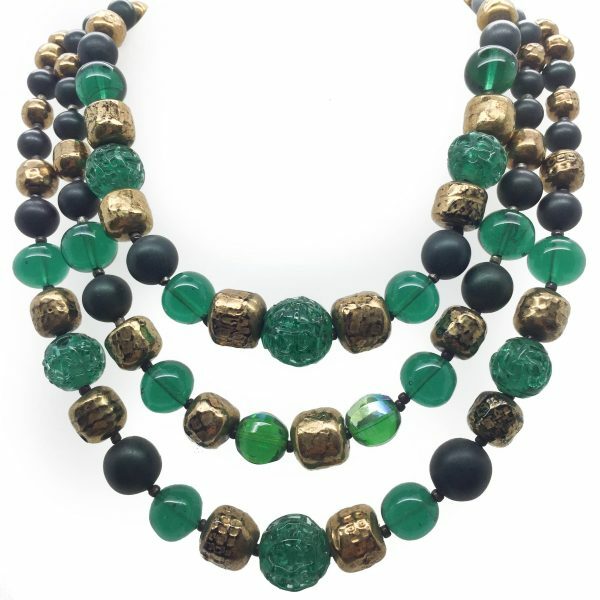 Featuring many different lavish types of handmade 1950s Art Glass beads in rich emerald green and wonderful bronze-gold lustres this is a very unusual piece. A feature clasp, as if it needed any more pazazz is the last word and the icing on the cake. Due to the number of high quality handmade art glass beads this is a weighty collar and drapes beautifully. 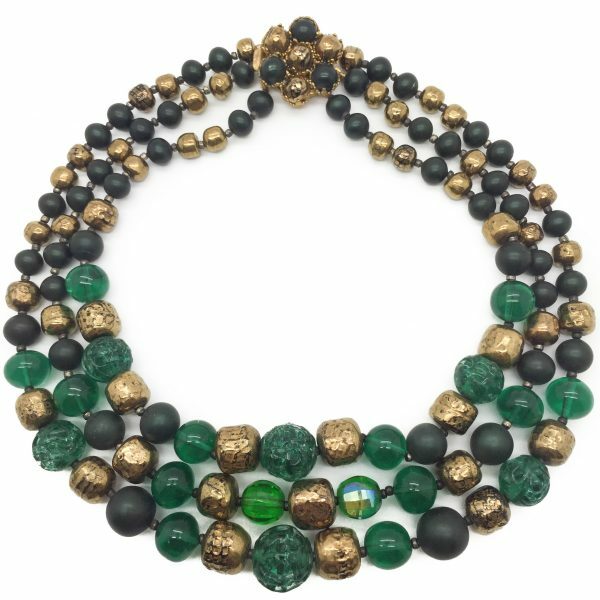 This 1950s art glass necklace is in excellent vintage condition and incredibly wearable and versatile for today's and no doubt future fashion and styles. The shortest strand of this 1950s art glass necklace measures approx. 40.5cm long and the clasp is beauifully concealed with the rosette style beaded clasp. Whether you are a vintage jewellery addict or simply enjoy magnificent examples of vintage costume jewellery for a timeless fashion statement or heirloom, this 1950s art glass necklace is a rare and wonderful handmade piece of 1950s costume jewellery. My aim is to find and present to you the best vintage costume jewellery pieces from anywhere in the world, so you can shop the best pieces with ease in our very own Jennifer Gibson Jewellery one stop shop and collection. Each piece is carefully chosen and curated and presented for its quality, style and design and of course absolute authenticity and in good condition. If you choose to buy from us, we commit to the item being as described. Your item will arrive beautifully packaged and presented, helping to preserve your one of a kind piece, for both you and future generations to enjoy. We also enclose a care card with your delivery to help you care for your piece of jewellery in the future. If you have any questions whatsoever, we are very happy to help and please don't hesitate to contact us. Please keep in mind that antique and vintage items are preloved and preworn and will typically show slight signs of wear or normal ageing. We do our utmost to point out in our descriptions any significant wear or fault with a piece and such condition will always be reflected in the price the piece is offered for. You can find out more about Jennifer Gibson Jewellery at our About Us Page. Thank you for visiting our Vintage Costume Jewellery shop.